Follow use of the interactive with a more scientific explanation of processes working in each of the reservoirs. Very simplified description of the carbon cycle, with concepts possibly being oversimplified. Numbers listed in the interactive should be checked by an expert, especially as the increase of CO2 is likely higher now. Comment from expert scientist: The game provides a very nice and fun approach to understand all compartments of Earth where carbon is stored and cycled and how these parts interact with each other. The provided links give age-appropriate information to understand additional concepts. 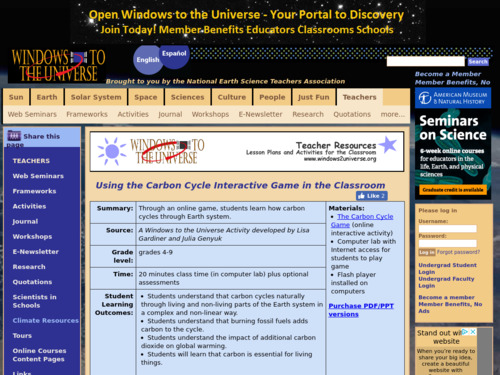 Students answer a series of true-false and multiple-choice questions while they play the carbon cycle game. The game has no ending - player keeps playing and choosing different pathways - models what a "cycle" really is. Extensive background materials for teachers.